I ship same day payment is received, except for weekends and holidays. Defective returns for replacment or store credit only. I've been selling online primarily through Ebay for the past several years. Recent price hikes and other ummm, "changes" have forced me to go elsewhere. Hello Atomic Mall! I have a unique selection of hard to find items. Thanks for looking! GSB gas cylinders (struts) for NSX rear trunk lid and glass engine hatch (rear window). Brand new in sealed packaging. Fits all Acura NSX model years 1991 ~ 2005. You will receive both pairs of struts. These high quality units are in stock and ready to ship as soon as payment arrives. We ship worldwide, including FPO and APO military. Includes all mounting hardware, including zinc-coated steel brackets, ball sockets, ball studs, washers and nuts. You won't need to cut out your old ball studs or re-use your oem brackets! We supply everything you need for installation. Used by Hundreds of happy NSX owners! Compare to Acura oem at $150+ or SOS at $119! Includes ball studs, washers, flange nuts, steel (not plastic) ball sockets, and custom zinc-plated steel brackets - everything needed for installation. No need to cut out your old ball studs! While overall length of the strut + end connectors is slightly shorter than oem to allow for easier install, barrel length is slightly longer, which means your factory plastic wire clip will not close on the bottom end. The easiest and best looking mod is to cleanly trim the bottom piece from the clip and attach it to the barrel using the upper clasp, but you can also leave it as-is and attach with the top clasp only. In addition, our trunk strut ring ends do not use a brass insert like the factory units. The strut pistons can twist freely inside the cylinder, alleviating any torsional force which may be encountered during use, and eliminating any potential binding problems. 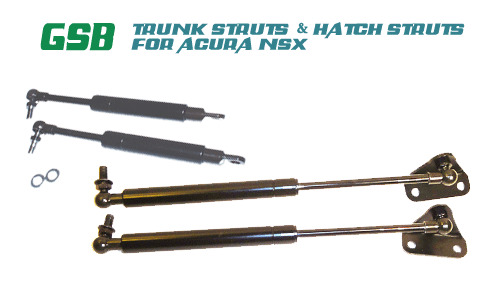 Our trunk struts have been used successfully by over 300 happy NSX owners, without a single report of binding or interference. However if it is important for you to retain a 100% factory stock appearance with your NSX, we recommend spending more (about double) to buy factory replacements with less compression force, or to send your existing struts out of country for recharging. If you just want struts that look good and work great, these are the ones you need. Price: $139.90 + FREE Priority Mail s/h inside U.S.
International shipping also available. See listing details for price. I usually ship within 24 hrs. of verified payment, subject to stock availability with tracking. APO/FPO military ships at same price as domestic. Defective struts will be replaced with identical units if returned within 30 days of purchase - sorry, no refunds on this item. Returns will ship at your expense, and replacements will ship at my expense. Please remember to leave f/b if you are satisfied with your purchase. Thanks for looking!